Bath is a village in Steuben County, New York, United States. The population was 5,641 at the 2000 census. Bath is the county seat of Steuben County. The community was named either for the English city or for Lady Bath, daughter of William Pulteney, one of the original landowners. The village was founded in 1793. The village was originally incorporated in 1816, but was not organized until 1836. According to the United States Census Bureau, the village has a total area of 2.9 square miles (7.5 km²).None of the area is covered with water. 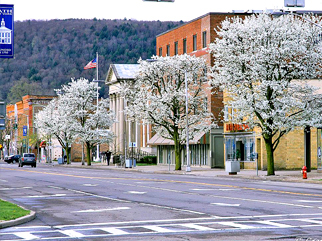 The village is adjacent to Interstate 86, a few miles east of the split with Interstate 390. New York State Route 54 intersects New York State Route 415 in the village. County Roads 10 and 13 also lead into Bath.